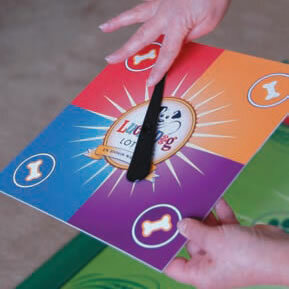 The Family Game That Lets Your Pet & Family Play Together! Make The Bet. Fun For You & Your Pet! You can play the exciting "Lucky Dog 1,000." This game allows the whole family to play along with your dog(s). Each player gets a turn to have your dog pick numbers; the first player to get to 1,000 wins the title "Lucky Dog Millionaire." This brand new and unique game can be played alone or with any number of players. Do you have a lucky dog? Want a new way to play the lottery? 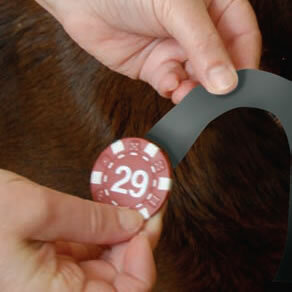 Play this fun game with your dog and let him/her pick your next set of winning numbers. Contents include the ability to play any type of lottery game. 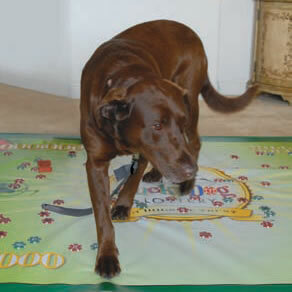 Place the Lucky Dog mat on your floor and spread out the numbered chips evenly on the mat. 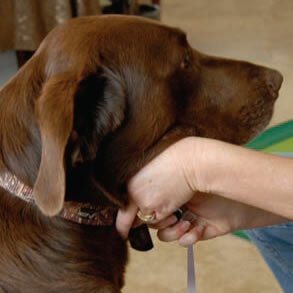 Attach the special leash to your dog's collar and adjust the length so the leash hits the floor. Spin the spinner. Then, throw a favorite dog toy to the corresponding bone on the Lucky Dog mat. As your dog chases the toy, watch as the leash magicaly picks up random numbers. Remove the chip and record the number on the score sheet. Repeat until all numbers have been picked. The Game That Lets Your Pet Make Your Bet. The new fun family game you play with your dog. Each player has the dog pick random numbers and the player with the highest score Wins! 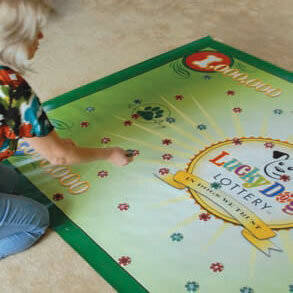 The game can also be used to let your dog pick your lucky Lottery Numbers. Fun for all ages and all size dogs. Click the button below to add the Lucky Dog Lottery Family Game to your wish list.